Fancy food abounds in France but even if you’re not out somewhere posh, here’s how to impress your French dining partner. 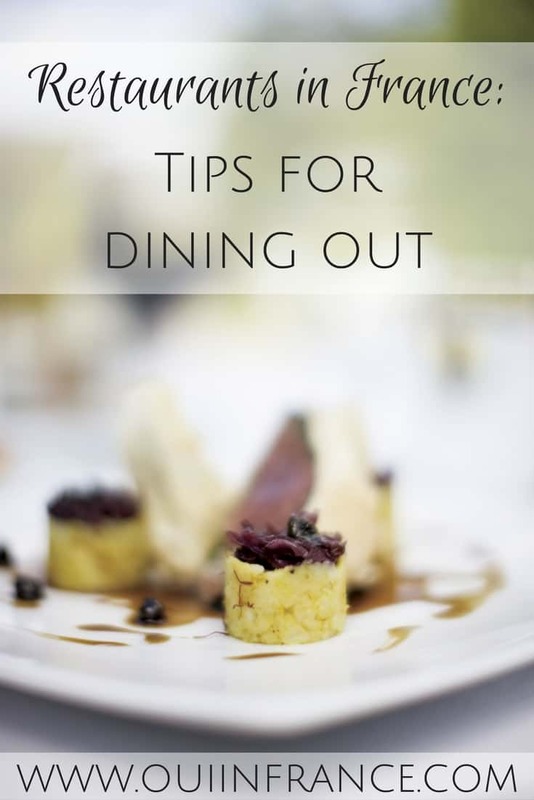 Read on for my dining etiquette in France tips. Don’t order your steak well-done. Ever. Although I’m not a fan of medium or rare steak and actually like burnt steak, when I’m out to eat in France, I order my steak medium. Crazily enough, I actually have gotten used to it and enjoy it. 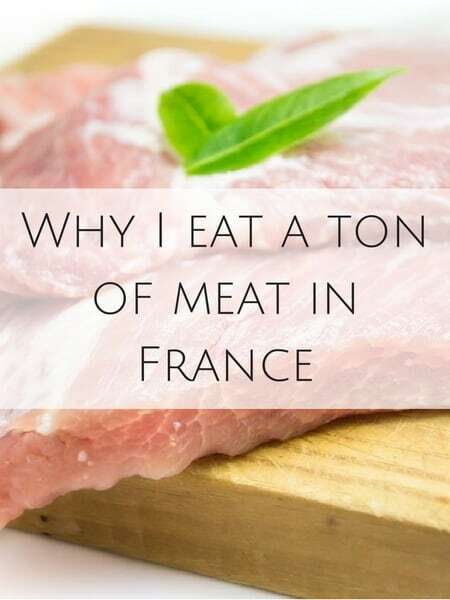 The French eat their meat à point usually and it’s almost always pink inside. Well-done steak would be bien cuit but you might get a few side eyes if you want your steak charred to death. Keep the fork in the left hand. No American switchy nonsense! When it comes to cutting your food, Americans do it differently. This is one major dining etiquette in France difference. And this often stands out if you’re in an international group. Typically, many Americans will put their fork in their left hand, the knife in the right, and cut the meat. Then to eat the meat, we switch and put the meat on the fork that’s now in our right hand. If we need to cut again, the fork goes back in the left, and so on. Tom’s brother kind of stared at me the first time we ate together because I would cut a few pieces and then switch and he informed me kids eat like that. Adults cut one piece and eat it with the fork never leaving the hand you cut it with. As time went on and I watched others around me, I realized the French way is to keep that fork in your left hand after cutting one piece of meat and use it to put the piece directly into your mouth without switching the fork to your right hand. So if you want to fit in, no switchy business! 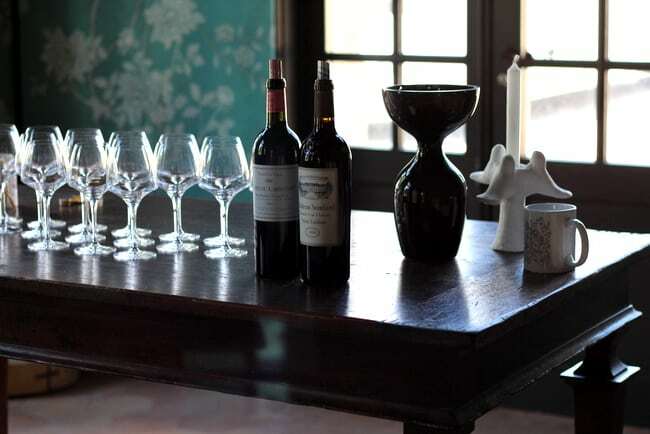 Not every French person is a wine expert, but it’s true that wine is a part of mealtime and French culture in general. No one is expecting you to know every last detail of every wine on the list, but at least know the basics like the main grape varieties, what and where the big wine regions are in France, what they’re famous for and some basic info on what wine goes with what type of dish. And if wine isn’t your thing, no worries. Ask your server (or the sommelier if there is one) for their recommendation. American restaurants are extremely accommodating to those with food allergies and other dietary restrictions (Servers also work for tips). In France, while you can certainly ask, meal substitutions aren’t the norm and might annoy those around you and the waitstaff. Stick to what’s on the menu unless it’s dire. If you just don’t like it, order something else. In many places, you can get your pick of side, type of sauce, etc. But asking to have something cooked plain with this or that on the side and veggies instead of fries, etc. will come across as culturally unaware. Dinner starts after 7 p.m. at the absolute earliest. If you invite a French person over for dinner or are tasked with making a dinner reservation, remember that the French do not eat dinner before 7 p.m. — and really that’s more like 8 p.m. So if you make an American-style reservation at 6:30 p.m., you will stand out and in many cases, restaurants don’t even open for dinner that early. 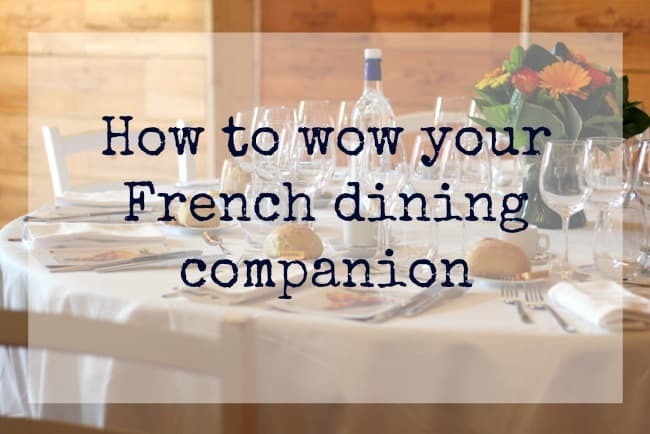 What would you add about dining etiquette in France? 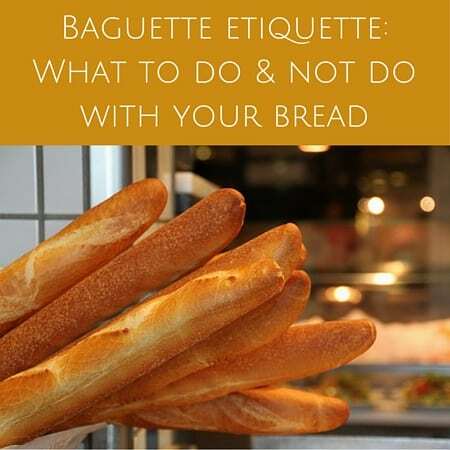 Restaurants in France: Tips for dining out Baguette etiquette: What to do and not do with your bread Don’t make these mistakes when ordering food and drink in France Why I eat a ton of meat in France 10 Biggest French faux pas you can commit. 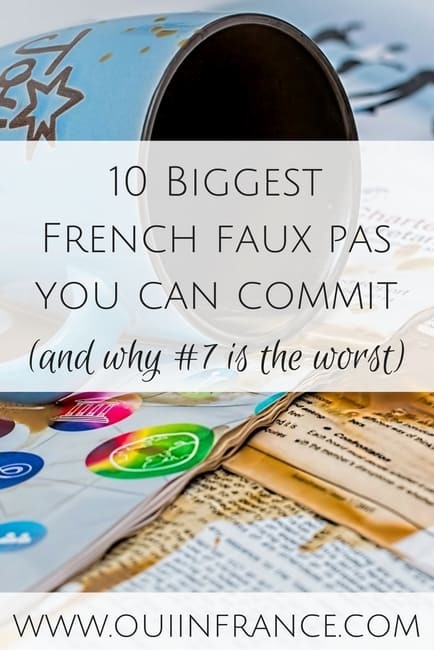 And why #7 is the worst. Yup, that’s it ! My mom taught us to use the knife and fork in the exact same way ! It’s funny how you pointed this out today ! We were taught it was bad table manners not to do so. It didn’t matter how anyone else ate, we did as we were told ! And don’t ever, ever, EVER eat at restaurant with a glass of cola. Before the meal as aperitiv, as a max if you explain you hat alcool. But never while eating. And oh! If you REALLY want to “WOW!” him or her, just casually order some traditionnal cuisine lyonnaise dishes: pork feets or ear, lamb brain or cooked guts. 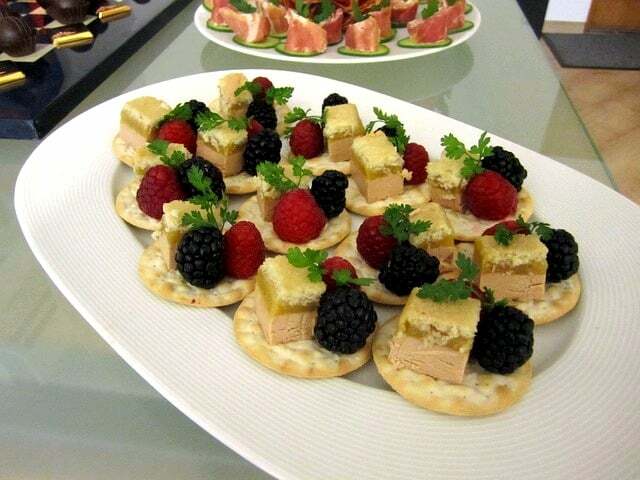 It is delivious, but almost purely French delicacy. With a little Gamay wine. I’m french and i switch my fork too 🙂 I don’t think it’s a french thing. Haha, I love the no substitutions rule – of reminds me of a picky visitor I had last summer. We were in St Malo, and I had just navigated translating her order at a creperie, involving a veggie swap and asking for “not too much cheese.” (I don’t even know if they understood that concept.) Then she looks at me and says, “Oh, and can you ask for salsa with that?” I had to immediately tell her no, that that was not an acceptable request. Good thing we weren’t kicked out of France! Bonjour! I just found your blog through a link on another travel blogger’s FB page. Thrilled to have found you. Looking forward to exploring your site. 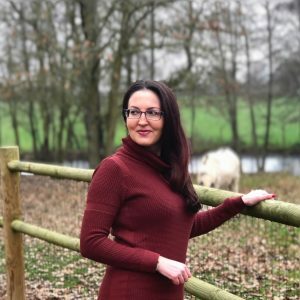 I’m Kelly and I blog at http://www.alovelylifeindeed.com. My husband and I live in the Boston area and part time in the northwest corner of Spain, in Galicia. Cheers! Wonderful post! My husband and I still can’t quite get used to the later dinner times! It seems to be that way in most of Europe! Thanks for all the tips! I’ll think twice before switching my forks ever again! There are never any refills in France. Not on coffee, not on sodas. Buffet-style restaurants are very rare. Oh, and French take food seriously. You just don’t play with your food! I have been studying the use of forks and knives in France for a couple of years trying not to be too obvious, and I have a theory. I think there are “tines up” foods and “tines down” foods. “Tines down” are fork left hand (for righties) because the strong right knife hand does either the muscle work of cutting meat or the precision work of folding the lettuce with the knife for salads and other things you arrange on the plate and spear. “Tines up” is for spooning actions where the right hand can bring it to the mouth more gracefully. Reverse for lefties. Observe!